Tick infestations can sometimes go unnoticed, especially during winter. Photo credit Dave Boxler. 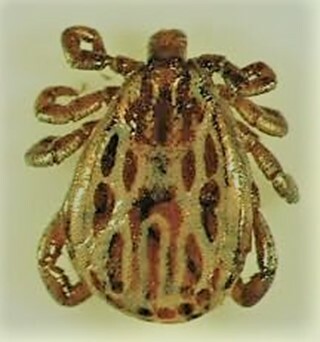 The winter tick, Dermacentor albipictus is widely, but unevenly distributed across the northern tier of states from Maine to Oregon and throughout the western states as far south as Texas. It is abundant in the woods and shrubs of upland and mountainous areas where it is commonly found on large domestic and wild animals. Horses and cattle are the most commonly parasitized domestic animals. Wild hosts include deer, elk, antelope and moose. It is most commonly called the “Moose Tick” in many northern states and in Canada. The winter tick is a one-host tick. It attaches to a host as a larva or “seed tick” and remains on the same host to develop into the 8-legged nymph and adult throughout a blood-feeding period of 5 to 14 weeks. Adults mate on the host after which the females drop to the ground and are ready to lay eggs. Females may lay from 2,000 to 4,000 eggs in 2 to 4 weeks. The eggs must incubate for 1 to 2 months before larvae hatch. Larvae from eggs laid in the spring form clusters on the ground that keep each other from drying out during the summer months. During the shortened day lengths and cooler nights in late summer and fall, larvae actively seek a host by climbing to the tips of grass and low-growing brush. Once on a host, larvae begin feeding for 9 to 20 days before changing into nymphs (Figure 1). Nymphs take from 10 to 75 days before changing to adults. Females (Figure 2) take from 1 to 2 weeks to become fully fed. Males (Figure 3) may mate with several females during the blood feeding period. Figure 1. 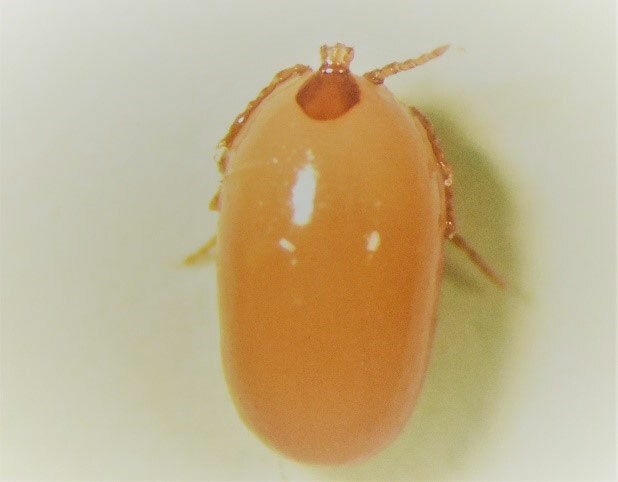 Engorged nymph, winter tick. Photo credit Dave Boxler. Figure 2. Female winter tick. Photo credit Dave Boxler. Figure 3. Male winter tick. Photo credit Dave Boxler. Tick infestations can sometimes go unnoticed, especially during winter. Long winter hair coats can mask developing infestations within the head, neck, flanks, chest, or brisket and along the belly region. If livestock have been rubbing, scratching, or biting affected body regions, please take an up close look at these areas to determine what is causing the irritation. 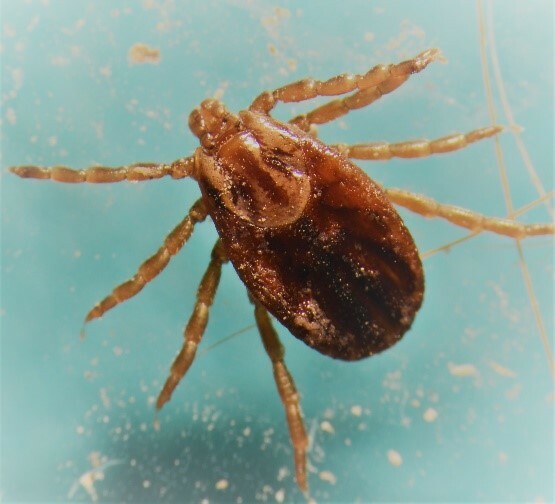 Uncontrolled, the winter tick can cause weakness, emaciation, loss of appetite, and anemia which may lead to greater susceptibility to disease and possible death. High populations of these ticks have been known to cause anemia and death of young horses, yearling deer and fawns. In horses, heavy tick numbers may also cause abdominal swelling, a condition known as “water belly”. There are a number of insecticides available for use, applied as pour-on or spray. Hand washing or sponging horses may be more desirable than spraying because some horses become excited and hard to control when sprayed. Avoid spray applications when weather is extremely cold or wet. Target spray treatments during sunny, warm days to allow the treatment to dry before night fall. Please contact your veterinarian or your local extension office for product recommendation. Please read, and follow label directions before using any pesticide.